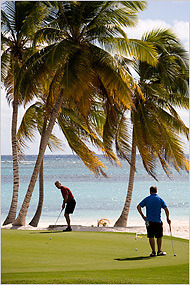 On Anguilla, Mr. Kanavos has developed the island’s first golf course, designed by Greg Norman, in the Baccarat Hotels and Residences at Temenos, a 115-villa project with a spa and a David Bouley restaurant. Eager to appeal to high-end buyers, Mr. Kanavos successfully lobbied the government to extend the airport runway to accommodate private jets. “I had thought about buying a piece of property and putting a hacienda up on it, but there are issues in Mexico,” said Larry Harvey, 43, a wealth consultant in The Woodlands, Tex., who recently bought a two-bedroom town house at the Viceroy Mayakobá, part of a new 1,600-acre golf community along the Riviera Maya, 42 miles south of Cancún, that Viceroy is developing around a Greg Norman championship course with the Rosewood, Fairmont and Banyan Tree resort developers. Mr. Harvey was referring to a Mexican law that puts limits on foreigners who seek to buy near the coast. Mexico employs a system that allows a Mexican bank to act as a trustee on behalf of a purchaser of this restricted land. “I had stayed at the Viceroy Santa Monica and liked it,” said Mr. Harvey, noting the California hotel’s designer, Kelly Wearstler, is also designing the Mexico property. "I have four boys who are learning how to play golf, and my wife, Mari, and I like the fact that the FedEx Cup is here in February. We’ll be able to rent” Mr. Harvey said. The FedEx Cup is coming! The FedEx Cup is coming!